Bitter melon also known as bitter gourd, is popular in Asian cultures. There is little scientific data to prove or disprove the health benefits of the bitter melon. But given the life expectancy of Asians, maybe we should consider giving the bitter melon a try! I did say there is little data. I did not say there is none. In recent years researchers are beginning to take a closer look at this vegetable. It has proven to have at least one strong attribute. Bitter Melon lowers dietary carbohydrate digestion. In other words, it is an effective tool in battling Type I and Type II diabetes. In Type I diabetes, it can lower the number of insulin injections required, though it will never eliminate the need for insulin. In Type II diabetes it reverses insulin resistance, thus providing a fair chance of controlling the disease with diet and exercise rather than drugs. Bitter Melon combines antioxidant properties with its ability to lower blood sugar levels. This combination means bitter melon helps prevent certain complications associated with diabetes such as blindness, diabetic feet, kidney disease, heart attack, or stroke. 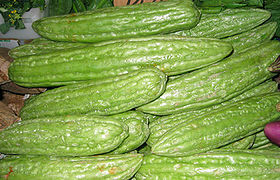 Bitter melon is an effective treatment for diabetes but it is not a cure. Trying to consume it in large quantities as a means of thwarting the disease can lead to dangerous hypoglycemia. If you have diabetes and are considering adding bitter melon to your diet, it is best to discuss this with your doctor first. Bitter Melon, as is true of most things in life, works best in moderation. Bitter Melon is yet another vegetable high in antioxidants, thus reducing your risk of cancer. It is a good source of minerals such as iron, zinc, potassium, manganese and magnesium. They actually have twice the level of potassium found in bananas. Bitter Melon stimulates easy digestion thereby decreasing indigestion and constipation. And it can lower your triglyceride level. As you can see it is worthwhile adding Bitter Melon to your diet simply for the vitamins and minerals. However, it has been used in treatment of several diseases too. 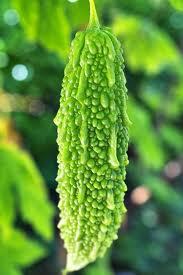 Besides being used in the treatment of diabetes, it has also been used in the treatment of measles, chicken pox, malaria, cancer, and gastrointestinal diseases. Researchers are even beginning studies to determine if Bitter Melon has any benefit in the treatment of Alzheimers and HIV.